People have been asking me what we’ve been up to since we’ve been home. The truth is a whole bunch of randomness which is great for us people that crave the random. Dusty has been working, learning all he can about his new DSLR camera and playing waterpolo. I’ve been out doing some new stuff like designing light fixtures, assisting my step brother build furniture and learning to upholster. Just last weekend, while Dusty was off in Michigan at a waterpolo tournament, I set off to Indianapolis for an upholstery bootcamp. I’ve always wanted to learn but didn’t quite know where to start. There aren’t upholstery classes anywhere to be found in Cincinnati. I could have tried to teach myself but 1) I didn’t know how to sew and 2) I have absolutely no tools. They were all stolen out of our garage last year. 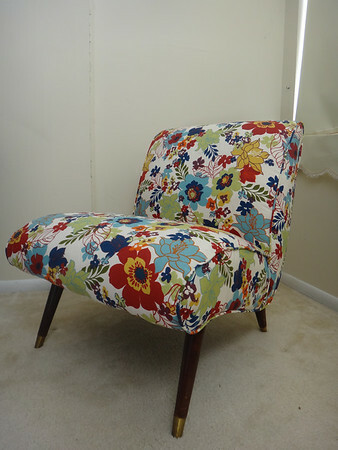 So, off to Indy for The ModHomeEc Upholstery Bootcamp hosted by Shelly of ModHomEc in her awesome upholstery studio. Six students brought an old chair to recover in just 3 days. I’m happy to say I was successful. 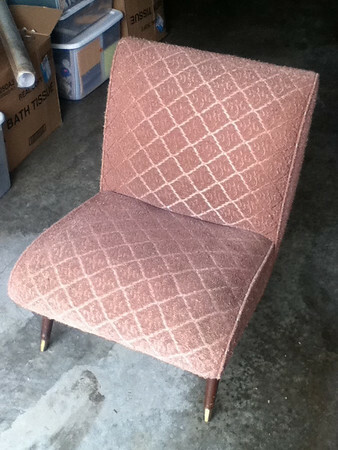 I won’t be winning any upholstery awards, but I think I did a pretty good job for my first go around. I found my chair on Craigslist for $30. Check out the before and after! I took my camera to Indy but forgot to bring it to class. :( Luckily, Shelly documented the entire process. She posted about our bootcamp and you can see the before, the guts and the after of my chair. Also, check out her studio! So jealous. Now, where can I get one of those? It felt great to get out and do something random again. Must be random more often. What should be next?